Hughes Network Systems, LLC (HUGHES) launched the world’s largest and fastest satellite broadband network, according to the company—this new network will support a variety of consumer, business, enterprise, in-flight and cellular backhaul applications across two continents. 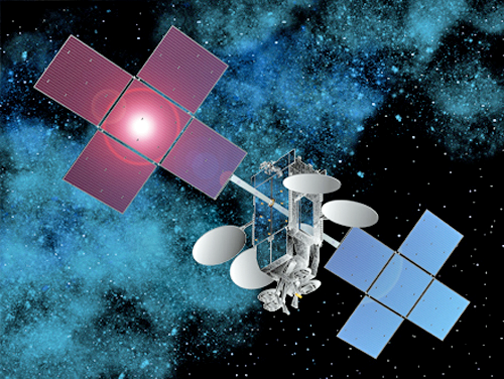 Artistic rendition of the Hughes EchoStar XIX satellite. The network uses the latest JUPITER™ System technology operating on the recently launched Hughes EchoStar XIX satellite, the world’s highest capacity broadband satellite. The network will also operate over EchoStar XVII and the Hughes hosted payload on the Eutelsat 65 degrees West satellite. With next year’s launch of Hughes hosted payload on the Telstar 19V satellite, the network will be further enhanced and provide additional coverage in South America. Supported by 49 gateways and hundreds of spot beams, the network will deliver more than 400 Gbps of capacity for use by consumer and business customers across North and South America. The Hughes JUPITER System is the first and only VSAT platform with System on a Chip (SoC) technology incorporating the latest DVB-S2X air interface standard, wideband 250 MHz carriers operating at more than 1 Gbps and with throughputs of more than 100 Mbps on every terminal. The JUPITER system is the market leader for service operators around the world for use with High Throughput Satellite (HTS) and conventional satellites. The Hughes consumer service in the US and Brazil, HughesNet®, already has more than one million subscribers—the new network will be leveraged to enhance and expand these services. Service delivery throughout the coverage area will be through a combination of direct HughesNet services and service partners. The network makes possible a new level of high-speed access services, to be marketed as Hughes HTS, for enterprises and government customers, as well as supporting significant expansion in the scope and performance of the company’s in-flight services for the aero market. The company announced their JUPITER™ Aero System for Inflight Connectivity (IFC), offering the industry’s fastest in-flight Internet connectivity, capable of supporting speeds in excess of 400 Mbps and operates on Ka- and Ku-band frequencies. The Hughes JUPITER Aero System leverages the proven capabilities of the JUPITER System—the mostly widely deployed HTS system in the world—to deliver high-performance mobility services across HTS and conventional satellites. The JUPITER System supports DVB-S2X—the satellite industry's latest air interface standard and widely recognized as the most bandwidth efficient standard developed for satellite transmissions. The dual-band JUPITER aeronautical terminal is based on ARINC 791 and incorporates a highly advanced Modem Manager (MODMAN) along with an option for a dual Ka- and Ku-band antenna. The terminal is fully compatible with both wide-beam and spot-beam satellites and supports rapid switching between beams and satellites, without loss of session as aircraft traverse the coverage area, thus enabling passengers to enjoy uninterrupted high-speed connectivity around the globe. The JUPITER Aero System incorporates the most advanced mobility features in the industry today, including Doppler correction, adaptive coding and modulation, and enhanced beam switching, allowing seamless handoffs between beams and from satellite to satellite—all managed by a single Network Management System (NMS). The system also includes a number of advanced features to improve the passenger experience, including onboard traffic management, Quality of Service (QoS), compression and acceleration. For air routes over the North America, customers will be able to use the new JUPITER Aero System in conjunction with the newly launched EchoStar XIX satellite, the world’s highest-capacity broadband satellite. This will enable service providers and their customers to take full advantage of the superior speed, throughput and economics of this new satellite. The JUPITER Aero System will ship in the second half of 2017. Paul Gaske, the Executive Vice President, North America, Hughes, indicated that with the new JUPITER Aero system, in-flight Internet services no longer have to be sub-par when compared to terrestrial networks. The JUPITER Aero system provides abundant bandwidth to support every passenger on even the largest of airliners, the dual band capability of the Hughes MODMAN and antenna systems enables airlines to provide this level of service across the globe.